With the emergence of edoxaban, the oral factor Xa inhibitors now appear consolidated as the dominant class of novel oral anticoagulants (NOACs) for stroke prevention in non-valvular atrial fibrillation (AF). The oral factor Xa inhibitors do not require an adequate time in therapeutic range to be effective, presenting a potential advantage over the vitamin K antagonists (VKAs). Guidelines are changing to reflect the increased choice of anticoagulants and as clinicians move away from the VKAs towards the relative safety and efficacy of NOACs, they must consider which one offers the best therapy for their patient. The ENGAGE-AF study was the latest phase III trial to report on the safety and efficacy of a new factor Xa inhibitor relative to warfarin. Both edoxaban 60mg once daily, and edoxaban 30mg once daily were found to be non-inferior compared to warfarin for the prevention of ischaemic stroke and systemic embolism, being associated with significantly lower rates of major bleeding, intracranial haemorrhage and cardiovascular death. A two-tiered dosing option may present clinicians with a further element of choice for the individual patient. NOACs are now licensed for stroke prevention in patients with nonvalvular AF in many countries around the world as an alternative to vitamin K antagonists (VKAs). Recent guidelines incorporating the NOACs often refer directly or indirectly to the augmented CHADS2 score or CHA2DS2-VASc score, advising that other non-CHADS2 stroke risk factors (including age 65–74 years, female gender and vascular disease) may also influence choice and combine to favour a decision to initiate anticoagulation. What Do Recent Guidelines Say? The 2012 American College of Chest Physicians guidelines suggest the use of dabigatran 150 mg twice daily rather than warfarin where an oral anticoagulant (OAC) is recommended (i.e. for patients with a CHADS2 = 1 or CHADS2 ≥2). Back-up dual antiplatelet therapy may beconsidered for patients unsuitable for OAC therapy.1 Only dabigatran is mentioned, as at the time of publication only dabigatran was licensed in North America for stroke prevention in AF. serum creatinine >1.5 mg/dl (i.e. who did not require the dose reduction to 2.5 mg twice daily). VKAs are a widely used OAC for stroke risk reduction in patients with AF, but may be underused in this capacity.13 Establishing standard clinical monitoring schedules for AF patients is inherently problematic as VKA initiation regimens involve loading doses and periodic blood tests to maintain the INR and the patient’s overall time in therapeutic range (TTR), an index of INR control. For AF patients starting VKA therapy, poor TTR remains an independent risk factor for major bleeding,15 although even when within the therapeutic range VKAs can carry a bleeding risk. a differential dietary vitamin K intake and drug–drug interactions that influence their pharmacokinetics or pharmacodynamics. Furthermore, although the use of VKA therapy had increased since 1980, and the proportion of patients receiving no therapy has decreased, many patients with AF received either antiplatelet therapy (10–56 %, median 30 %) or no therapy (4–48 %, median 18 %). Thus, many patients at moderate or high risk for stroke were not treated according to guidelines.19 The benefits of oral anticoagulation over antiplatelet or no therapy are often highlighted within guidelines, but when we consider that patients on antiplatelet or no therapy may suffer bleeding rates comparable with those on VKAs,20 promoting their correct use becomes important. As the NOACs become more readily available, we may expect to see a reduction in the unacceptable numbers of these AF patients at increased risk for stroke who, once passed over for oral anticoagulation, remained unprotected. The ESC 2012 guidelines promote the NOACs in non-valvular AF because they show non-inferiority compared with VKAs and are inherently safer as their performance in phase III studies have shown.21–23 Currently, the oral factor Xa inhibitors are generating significant interest in stroke prevention as they dominate the NOAC field of choice. When analysed together, the factor Xa inhibitors significantly reduce stroke, systemic thromboembolism and intracranial haemorrhage compared with warfarin in patients with AF.25 However, there are too few guidelines on how best to measure (and reverse) the in vivo activity in clinical settings. Both dose regimens of edoxaban achieved significance in the non-inferiority analysis when compared with warfarin. The rate for the primary efficacy endpoint of stroke or systemic embolism in the on-treatment analysis was 1.50 % with warfarin (median TTR achieved, 68.40 %) compared with 1.18 % for edoxaban 60 mg (HR of 0.79; 97.5 % CI, 0.63–0.99) and 1.61 % for edoxaban 30 mg (HR of 1.07; 97.5 % CI, 0.87–1.31). High-dose edoxaban was significantly superior to warfarin in the on-treatment analysis. In the pre-specified intention-to-treat analysis, neither regimen of edoxaban was found to be superior to warfarin, although there was a trend favouring edoxaban 60 mg versus warfarin (HR of 0.87; 97.5 % CI, 0.73–1.04; P=0.08) over edoxaban 30 mg versus warfarin (HR of 1.13; 97.5 % CI, 0.96–1.34; P=0.10). For rates of ischaemic stroke only edoxaban 30 mg was associated with a significantly increased rate at 1.77 % (HR of 1.41; 95 % CI, 1.19–1.67), when compared with either edoxaban 60 mg or well-controlled warfarin, between which, ischaemic stroke rates were the same at 1.25 % (HR of 1.00; 95 % CI, 0.83–1.19; P=0.97). The rates for the primary endpoint of major bleeding were significantly lower for high- and low-dose edoxaban compared with warfarin: 3.43 % with warfarin versus 2.75 % for edoxaban 60 mg (HR of 0.80; 95 % CI, 0.71–0.91) and 1.61 % with edoxaban 30 mg (HR of 0.47; 95 % CI, 0.41–0.55). The rate of haemorrhagic stroke was significantly higher with warfarin, 0.47 % as compared with 0.26 % for high-dose edoxaban (HR of 0.54; 95 % CI, 0.38–0.77) and 0.16 % for low-dose edoxaban (HR of 0.33; 95 % CI, 0.22–0.50). Edoxaban 60 mg would complement current guidelines on stroke prevention in non-valvular AF due to its consistency among the NOAC range in terms of its non-inferiority to warfarin, and its safety profile with respect to bleeding risk and intra-cranial haemorrhage; while it may have the concomitant benefit of reducing cardiovascular mortality. It comes as a once-daily dose with a patient-friendly profile in terms of its tolerance and ease of use, and may indeed present a clinician-friendly profile too, allowing the drug to be fitted to the patient should concerns of safety over the risk of bleeding outweigh efficacy in stroke prevention. By reducing the dose to 30 mg where there is anticipated increased drug exposure, edoxaban would remain non-inferior to warfarin in such patients. With the availability of so many NOACs as alternatives to warfarin, we are now rather spoilt for choice, and we have the opportunity to fit the drug to the patient (and vice versa). As discussed above, good quality anticoagulation control with warfarin is associated with high efficacy and safety (with low stroke and bleeding risks), and thus, effective stroke prevention in guidelines essentially means the use of well-controlled warfarin (TTR ≥70 %) or one of the NOACs. A decision dilemma is how to predict upfront those newly diagnosed non-anticoagulated AF patients who would do well on warfarin with high TTR, given costs of the new drugs and that the benefits of NOACs over warfarin may be only marginal in those with high TTRs. 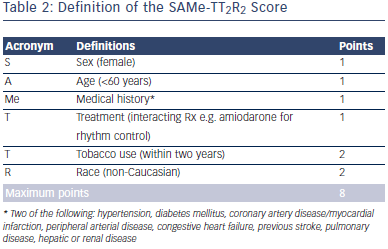 The new SAMe-TT2R2 score33,34 (see Table 2) may help with the decision-making process, as this is a new user-friendly validated simple clinical score, which identifies those AF patients likely to do well on warfarin (SAMe-TT2R2 score 0–1) or those more likely to have poor anticoagulation control (SAMe-TT2R2 score ≥2). 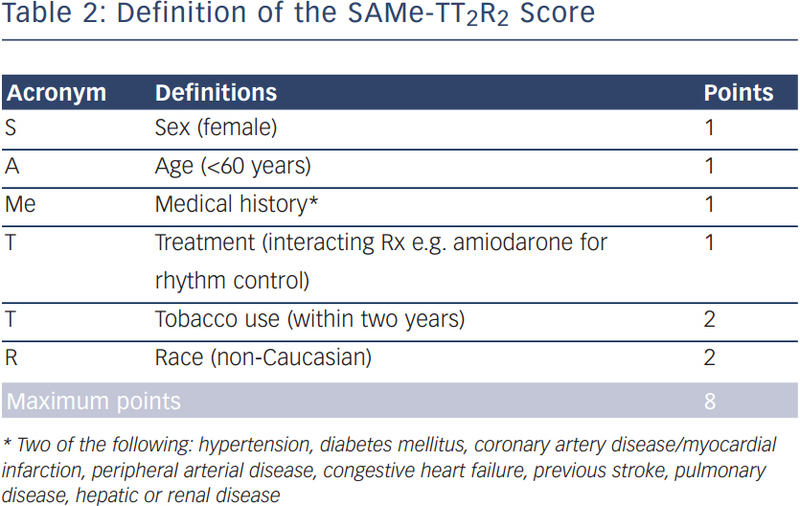 An ESC position document12 recommends that AF patients with a SAMe-TT2R2 score >2 should be considered to be better off being started on NOACs as initial therapy, or have more aggressive efforts to improve anticoagulation control. You JJ, Singer DE, Howard PA, et al. Antithrombotic therapy for atrial fibrillation: Antithrombotic Therapy and Prevention of Thrombosis, 9th ed: American College of Chest Physicians Evidence-Based Clinical Practice Guidelines. Chest 2012;141(2 Suppl):e531S–75S. Skanes AC, Healey JS, Cairns JA, et al. Focused 2012 update of the Canadian Cardiovascular Society atrial fibrillation guidelines: recommendations for stroke prevention and rate/ rhythm control. Can J Cardiol 2012;28:125–36. Furie KL, Goldstein LB, Albers GW, et al. Oral antithrombotic agents for the prevention of stroke in nonvalvular atrial fibrillation: a science advisory for healthcare professionals from the American Heart Association/American Stroke Association. Stroke 2012;43:3442–53. Scottish Intercollegiate Guidelines Network (SIGN). SIGN 129: Antithrombotics: indications and management, 2012. Available at: www.sign.ac.uk/guidelines/fulltext/129/ (accessed 20 March 2014). Camm AJ, Lip GY, De Caterina R, et al. 2012 focused update of the ESC Guidelines for the management of atrial fibrillation: an update of the 2010 ESC Guidelines for the management of atrial fibrillation. Developed with the special contribution of the European Heart Rhythm Association. Eur Heart J 2012;33:2719–47. Ogawa S, Aonuma K, Tse H-F, et al. The APHRS’s 2013 statement on antithrombotic therapy of patients with nonvalvular atrial fibrillation. Journal of Arrhythmia 2013; 29:190–200. Dentali F, Riva N, Crowther M, et al. Efficacy and safety of the novel oral anticoagulants in atrial fibrillation: a systematic review and meta-analysis of the literature. Circulation 2012;126:2381–91. Dogliotti A, Paolasso E, Giugliano RP. Novel oral anticoagulants in atrial fibrillation: a meta-analysis of large, randomized, controlled trials vs warfarin. Clin Cardiol 2013;36:61–7. Ruff CT, Giugliano RP, Braunwald E, et al. Comparison of the efficacy and safety of new oral anticoagulants with warfarin in patients with atrial fibrillation: a meta-analysis of randomised trials. Lancet 2014;383:955–62. Lip GY, Larsen TB, Skjoth F, Rasmussen LH. Indirect comparisons of new oral anticoagulant drugs for efficacy and safety when used for stroke prevention in atrial fibrillation. J Am Coll Cardiol 2012;60:738–46. Larsen TB, Lip GY. Warfarin or novel oral anticoagulants for atrial fibrillation? Lancet 2014;383:931–3. De Caterina R, Husted S, Wallentin L, et al. Vitamin K antagonists in heart disease: Current status and perspectives (Section III). Position Paper of the ESC Working Group on Thrombosis -- Task Force on Anticoagulants in Heart Disease. Thromb Haemost 2013;110:1087–107. Ansell J, Hirsh J, Hylek E, et al. Pharmacology and management of the vitamin K antagonists: American College of Chest Physicians Evidence-Based Clinical Practice Guidelines (8th Edition). Chest 2008;133(6 Suppl):160S–98S. Gallego P, Roldan V, Marín F, et al. Cessation of oral anticoagulation in relation to mortality and the risk of thrombotic events in patients with atrial fibrillation. Thromb Haemost 2013;110:1189–98. Connolly SJ, Pogue J, Eikelboom J, et al. Benefit of oral anticoagulant over antiplatelet therapy in atrial fibrillation depends on the quality of international normalized ratio control achieved by centers and countries as measured by time in therapeutic range. Circulation 2008; 118:2029–37. Gallagher AM, Setakis E, Plumb JM, et al. Risks of stroke and mortality associated with suboptimal anticoagulation in atrial fibrillation patients. Thromb Haemost 2011;106:968–77. Ogilvie I, Newton N, Welner S, et al. Underuse of oral anticoagulants in atrial fibrillation: a systematic review. Am J Med 2010;123:638–45.e4. Ogilvie IM, Welner SA, Cowell W, Lip GY. Characterization of the proportion of untreated and antiplatelet therapy treated patients with atrial fibrillation. Am J Cardiol 2011;108:151–61. Ogilvie IM, Welner SA, Cowell W, Lip GY. Ischaemic stroke and bleeding rates in ‘real-world’ atrial fibrillation patients. Thromb Haemost 2011;106:34–44. Granger CB, Alexander JH, McMurray JJ, et al. Apixaban versus warfarin in patients with atrial fibrillation. N Engl J Med 2011;365:981–92. Tzeis S, Andrikopoulos G. Novel anticoagulants for atrial fibrillation: a critical appraisal. Angiology 2012;63:164–70. Bruins Slot KM, Berge E. Factor Xa inhibitors versus vitamin K antagonists for preventing cerebral or systemic embolism in patients with atrial fibrillation. Cochrane Database Syst Rev 2013;8:CD008980. Gonzalez-Quesada, CJ, Giuliano RP. Comparison of the phase III clinical trial designs of novel oral anticoagulants versus warfarin for the treatment of nonvalvular atrial fibrillation: implications for clinical practice. Am J Cardiovasc Drugs 2014;14:111-27. Ogata K, Mendell-Harary J, Tachibana M, et al. Clinical safety, tolerability, pharmacokinetics, and pharmacodynamics of the novel factor Xa inhibitor edoxaban in healthy volunteers. J Clin Pharmacol 2010;50:743–53. Ruff CT, Giugliano RP, Antman EM, et al. Evaluation of the novel factor Xa inhibitor edoxaban compared with warfarin in patients with atrial fibrillation: design and rationale for the Effective aNticoaGulation with factor xA next GEneration in Atrial Fibrillation-Thrombolysis In Myocardial Infarction study 48 (ENGAGE AF-TIMI 48). Am Heart J 2010;160:635–41. Camm AJ, Bounameaux H. Edoxaban: a new oral direct factor xa inhibitor. Drugs 2011;71:1503–26. Weitz JI, Connolly SJ, Patel I, et al. Randomised, parallelgroup, multicentre, multinational phase 2 study comparing edoxaban, an oral factor Xa inhibitor, with warfarin for stroke prevention in patients with atrial fibrillation. Thromb Haemost 2010;104:633–41. Hokusai-VTE Investigators, Büller HR, Décousus H, et al. Edoxaban versus warfarin for the treatment of symptomatic venous thromboembolism. N Engl J Med 2013;369:1406–15. Giugliano RP, Ruff CT, Braunwald E, et al. Edoxaban versus warfarin in patients with atrial fibrillation. N Engl J Med 2013;369:2093–104. Boriani G. Predicting the quality of anticoagulation during warfarin therapy: The basis for an individualized approach. Chest 2013;144:1437–8. Apostolakis S, Sullivan RM, Olshansky B, Lip GY. Factors affecting quality of anticoagulation control among patients with atrial fibrillation on warfarin: the SAMe-TT2R2 score. Chest 2013;144:1555–63.